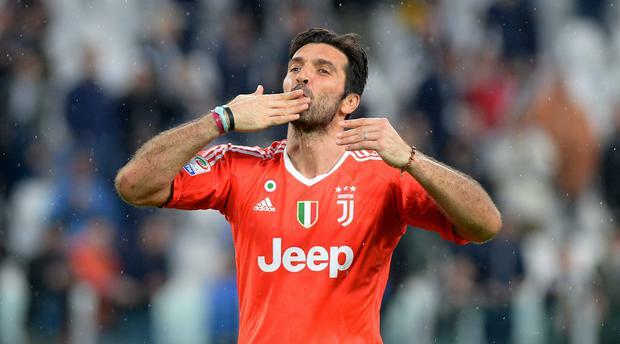 Italy goalkeeper Gianluigi Buffon announced his 17-year career as a Juventus player is to come to an end in an emotional press conference at the Allianz Stadium, Turin. Earlier this season Buffon, 40, captained Juventus to their seventh successive Serie A title, their ninth overall. The former Parma goalkeeper told gathered media that he will make his final Juventus appearance against Hellas Verona on Saturday. "Saturday will be my final match for Juventus and to end this journey with two cups and with the president and the entire Bianconeri world by my side, will be very special," said Buffon. "I would like to conclude by thanking the Juventus family and the whole club. I was always be grateful to all of you forever. "What will I do? Saturday's match is the only thing that is for certain," said Buffon. "The most exciting proposal for my career off the pitch has come from the president. Next week, after a few days to reflect, I shall make up my mind and follow my best instincts. "Andrea [Agnelli] and I will continue to have dialogue and I will rely on his support and suggestions. "Until 15 days it was sure I would stop playing football, but now new challenges have arrived both on the pitch and outside the pitch. "I would say the next week, after some reflections, I will make the ultimate decision." The Italian is still facing the prospect of a European ban over comments he made on the performance of English referee, Michael Oliver. Buffon said Oliver had 'a rubbish bin for a heart' after awarding a controversial late penalty in Juventus' Champions League semi-final defeat to Real Madrid. “To award such a doubtful, or super doubtful, penalty just ahead of the final whistle and destroy the work of a team who gave absolutely everything you have to have a rubbish bin instead of your heart,” he said. Buffon will make his 177th and final Italy appearance in a friendly against the Netherlands on June 4 and will bow out as retire as the country's most-capped player of all time. This summer's World Cup in Russia would have been his sixth appearance at the finals, but Italy missed out on qualification after a play-off defeat to Sweden. Harry Clarke John Giles has stated that he believes John Delaney should resign from the Football Association of Ireland (FAI).as he addressed concerns raised about the John Giles Foundation last weekend.